When you’ve got leverage, don’t be afraid to use it. That’s been Google’s modus operandi in the news and publishing world over the last year or so as it has pushed its AMP platform, funding various news-related ventures that may put it ahead, and nourished its personalized Chrome tabs on mobile. The latter, as Nieman Labs notes, grew 2,100 percent in 2017. You may have noticed, since Chrome is a popular mobile browser and this setting is on by default, but the “Articles for You” appear automatically in every new tab, showing you a bunch of articles the company thinks you’d like. And it’s gone from driving 15 million article views to a staggering 341 million over the last year. In late 2016, when Google announced the product, I described it as “polluting” the otherwise useful new tab page. I also don’t like the idea of being served news when I’m not actively looking for it — I understand that when I visit Google News (and I do) that my browser history (among other things) is being scoured to determine which categories and stories I’ll see. I also understand that everything I do on the site, as on every Google site, is being entered into its great data engine in order to improve its profile of me. Like I said, when I visit a Google site, I expect that. But a browser is supposed to be a tool, not a private platform, and the idea that every tab I open is another data point and another opportunity for Google to foist its algorithms on me is rankling. It has unsavory forebears. Remember Internet Explorer 6, which came with MSN.com as the default homepage? That incredible positioning drove so much traffic that, for years after (and indeed today), it drove disgusting amounts of traffic to anything it featured. But that traffic was tainted: you knew that firehose was in great part clicks from senior citizens who thought MSN was the entire internet. Of course the generated pages for individual users aren’t the concentrated fire of a link on a major portal, but they are subject to Google approval and, of course, the requisite ranking bonus for AMP content. Can’t forget that! But wherever you see the news first, that’s your news provider. And you can’t get much earlier than “as soon as you open a new tab.” That’s pretty much the ultimate positioning advantage. Just how this amazing growth occurred is unclear. If there’s been any word of mouth, I missed it. “Have you tried scrolling down? The news is just right there!” It seems unlikely. My guess would be that the feature has been steadily rolling out in new regions, opting in new users who occasionally scroll down and see these stories. And unlike many other news distribution platforms, there isn’t much for publishers or sites like this one to learn about it. How are stories qualified for inclusion? 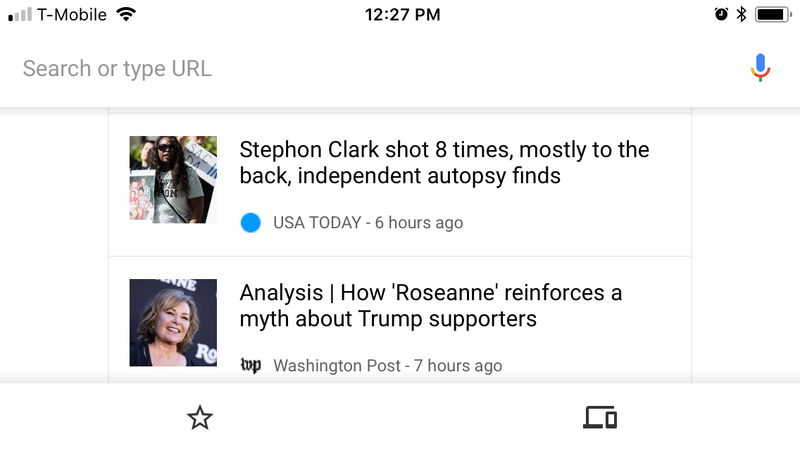 Is there overlap with Google News stuff? What’s shown if people aren’t signed in? I’ve asked Google for further info. Do you, like me, dislike the idea that every time you open a tab — not just when you use its services — Google uses it as an opportunity to monetize you, however indirectly? Fortunately, and I may say consistent with Google’s user-friendliness in this type of thing, you can turn it off quite easily — on iOS, anyway. Open the menu at the top right of any tab and hit settings. There should be a “Suggested articles” toggle — disable that and you’re done. While you’re at it, you might just head into Privacy and disable search and site suggestions and usage data. On Android? You’ll have to dig into the app’s flags and toggle the hidden setting there. Not as user-friendly.